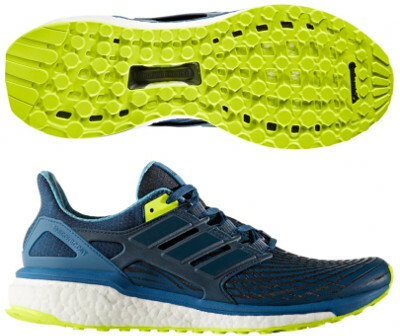 Adidas Energy Boost 4 are neutral cushioned running shoes. The Adidas Energy Boost 4 features last evolution from the running shoe which introduces first the Boost™ concept in midsole. Over the years it not only becomes heavier and more complex but also more expensive following trend from more fashionable Ultra Boost. Unlike other models from the german brand like more dynamic Supernova Glide 9, it keeps the buzzword "Boost" within its commercial name and gets rid of the edition number, something which may lead to confusion if not really up to date in marketing involved. Upper is plenty of fused (TechFit®) elements featuring enhanced fit and more complex than in its predecessor Energy Boost 3, particularly the plastic cage wrapping midfoot which raises some concerns about breathability. The Energy Boost 4 shares the same solution first seen in Ultra Boost ST based on FitCounter™ moulded heel counter. Achilles fit system (named "S-Curve") adds protection and prevents slippery while lightweight TPU panels wrap midfoot for custom fit. Midsole is basically made of Boost™ foam with thin EVA layer on top of it to improve stability and quicker response. What is definitely a huge improvement is the full length outsole with grid configuration (aka StretchWeb, identical to the one Supernova Glide 9 features) made of Continental™ rubber for more secure toe off and better grip even on wet surfaces. As usual in other Adidas premium running shoes, Torsion® system features natural integrity in the midfoot for good stability decoupling forefoot from rearfoot.